Join our first CAMPLE LINE Reading Group as part of our programme Closely Watched Trains! In 1973 Theroux took an epic four month journey by rail through Europe, Asia and the Middle East. 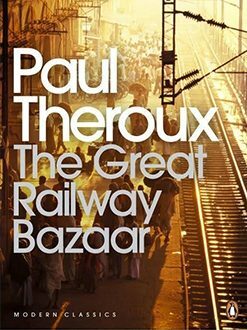 Forty years later, The Great Railway Bazaar is a modern classic of travel literature. Exploring legendary train routes – the Orient Express, the Khyber Pass Local, the Delhi Mail from Jaipur, the Golden Arrow of Kuala and the Trans-Siberian Express – the book is a romantic tribute to the joys of railways and train travel. But it is also full of wry and fascinating observations about landscape, culture and the people Theroux encounters on his way.